Palmako County 1 & 2: Palmako County Log Cabins are in two sizes: Size 1: 3.9m x 2.9m Size 2: 3.9m x 3.9m. Additional to above dimensions - Both Sizes feature a Front Roof Canopy of 1.5m (This can be sawn back during assembly if it is too large) The Palmako County 1 & 2 Log Cabins are attractive single glazed log cabin with double opening doors featuring Glass from Top to Bottom and two windows. The Palmako County 1 and 2 Log Cabins are a light and airy space for your garden offering very many potential uses and extremely good levels of natural insulation. 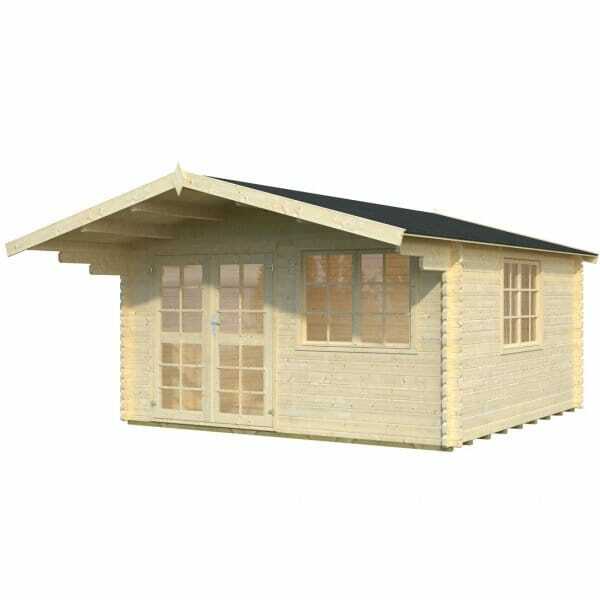 This cabin is available in two sizes allowing you to choose the size best suited to your garden from Simply Log Cabins.